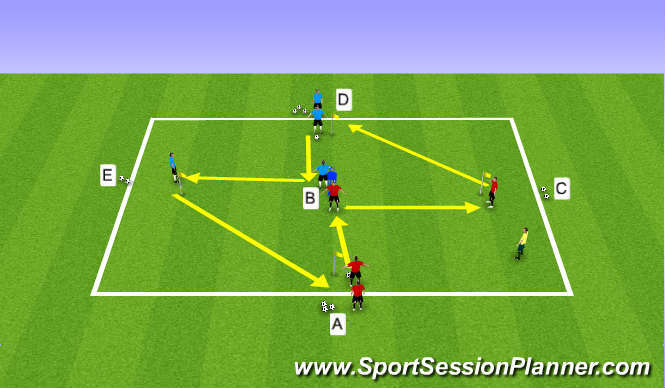 Play begins with Player &apos;A&apos; playing into Player &apos;B&apos; (1/2 Turned) who turns on their first touch (inside foot, shielding the ball from defender) and plays it for Player &apos;C&apos; who is running onto the ball and Player &apos;D&apos; plays a pass on his/her first touch. 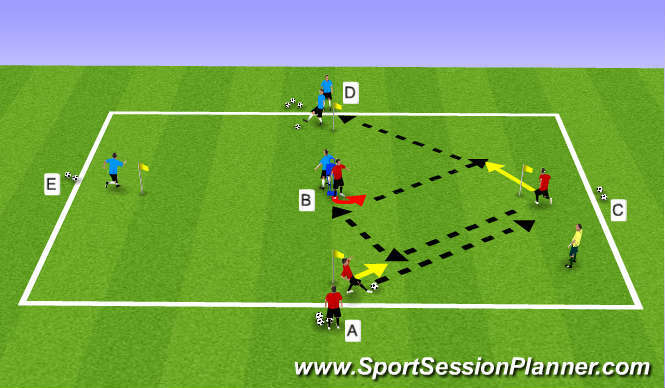 At the same time as Player &apos;A&apos; starts the play so does Player &apos;D&apos; who plays to another Player &apos;B&apos; (1/2 tunrned) who turns on his/her first touch (outside foot, shielding the ball from defender) and plays it for Player &apos;E&apos; who is running onto the ball and plays a pass to Player &apos;A&apos;. Player &apos;A&apos; plays a pass to Player &apos;C&apos; who has shown for the ball and plays a 1-2 (return) pass. 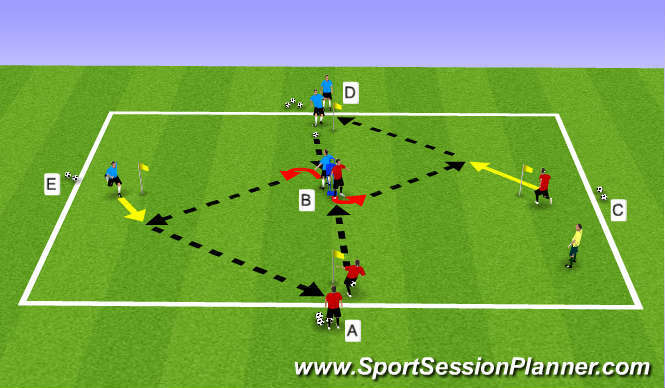 Player &apos;A&apos; receives and plays to Player &apos;B&apos; who turns on his/her first touch and plays a pass for Player &apos;C&apos; to run onto. Player &apos;C&apos; plays a first time pass to Player &apos;D&apos;. As Player &apos;A&apos; begins the play so does Player &apos;D&apos; simutaneously to Player &apos;E&apos;. 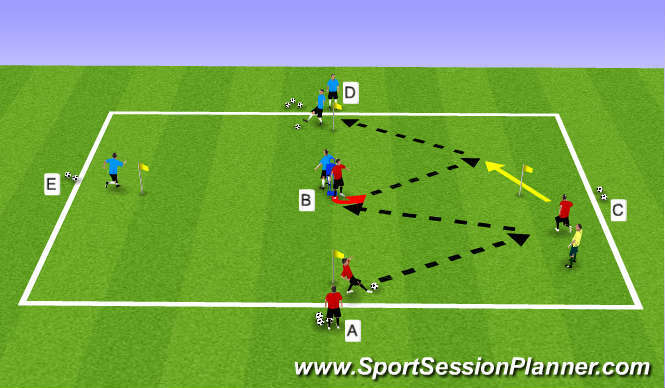 Player &apos;A&apos; plays a pass to Player &apos;C&apos; who has shown for the ball and plays a Wall Pass to Player &apos;B&apos; (1/2 Turned) and looks for the return pass behind the flag to run onto and make a first touch pass to Player &apos;D&apos;. As play starts with Player &apos;A&apos; so does Player &apos;D&apos; to Player &apos;E&apos;. 1. Play pass to the forward foot if possible to encourage forward play. 2. The speed of the pass is very important today. Players need to be able to play/receive with speed at all times. 3. Show (Support) the pass when a player lifts their head up or takes a touch. 4. Shield the ball when receiving and change the direction of the path of the ball (touch direction). 5. Timing of the forward pass with the right weight and speed in front of the player running onto the ball is key to successful penetrating play.